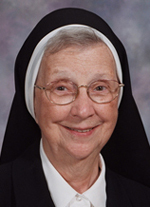 Sister Theresa Kane, O.S.F., 87, died Feb. 3 in Assisi House, Aston. She had been a professed member of the Sisters of St. Francis of Philadelphia for 66 years. Sister Theresa (Theresa Frances Kane) was born in Philadelphia where she was a member of St. Boniface Parish and a graduate of Hallahan High School. She entered the congregation in 1949, professed her first vows in 1951 and earned a B.S. in education from Mount St. Mary University. She ministered primarily in elementary education, spending 42 years in the Archdiocese of Baltimore, 36 of those years at Immaculate Conception School in Towson — first as teacher and later as substitute teacher. In 1996 she was Immaculate Conception School’s nominee for Teacher of the Year. In 2000 she was awarded the Sister Rose Anita McDonnell, I.H.M. Award in recognition of her lifelong dedication to the ministry of education. She also taught at two other Catholic schools in Baltimore, as well as schools in the Diocese of Wilmington and in North Augusta, South Carolina and Bethesda, Maryland. The funeral Mass for Sister Theresa was celebrated on Feb. 8 in Assisi House. Burial was in Our Lady of Angels Cemetery in Aston. Sister Theresa is survived by her nieces and nephews, and by her Franciscan family.